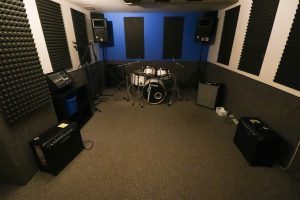 Professional, affordable, musicians rehearsal space, fully kitted out with PA, mics, amps and drum shell with Staff always on site. 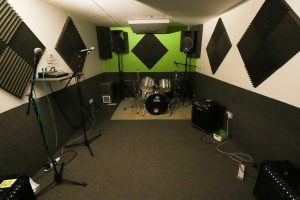 Guitars, Bass Guitars, Keyboard and Cymbals, all available to hire at £5 per session. 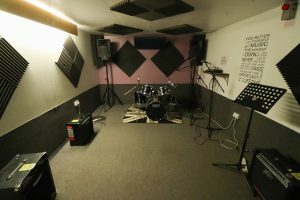 Studio recording available incl video sessions + outside events, gear & engineers Gig equipment & PA hire incl party packages with lights. Our on site shop has refreshments & a large range of music essentials from strings, sticks & leads to cases, drumheads & cymbals. WiFi, toilets and free parking. For full terms & conditions, please see T’s + C’s page. Having trouble finding us? There’s photos of the building on Google maps (Street View and Birds Eye View) in the photos section.